The original Cheney and Hewlett were Nathaniel Cheney (1824-1901) and Charles Hewlett (1830-1901). Both men were employed at Daniel Badger's Architectural Iron Works before forming their own company. 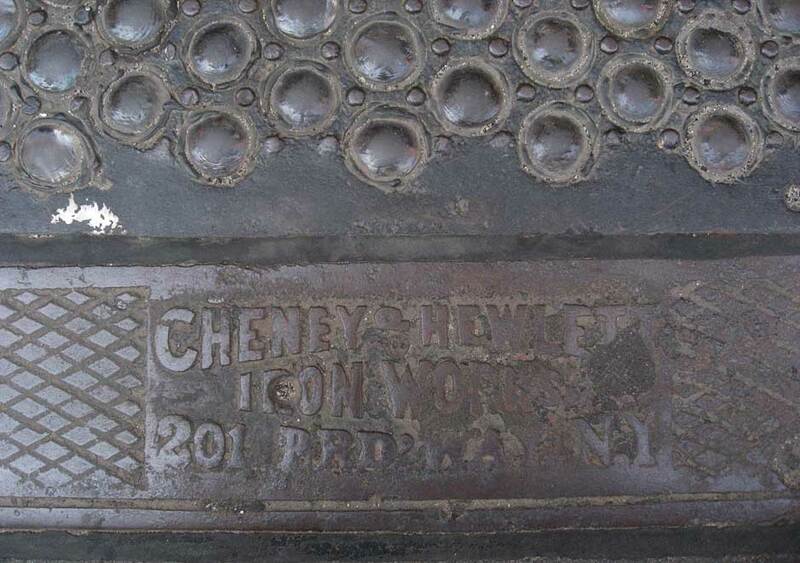 Cheney was listed in city directories at the Architectural Iron Works from 1857 until 1881. Hewlett was listed for a shorter time, 1874 to 1881. In 1865 Nathaniel Cheney was vice-president of the Architectural Iron Works and lived at 280 Clermont Ave., Brooklyn, NY. This same year IRS assessed him a total of $87.50 taxes, based on an income of $2750 (3%, $82.50), one gold watch valued at $100 (1%, $1.00), another gold watch valued at $200 (1%, $2.00), and a pianoforte valued at $200 (1%, $2.00). In the 1870 U. S. Census Nathan Cheney, age 46, born Massachusetts, lived in Manhattan in a home headed by Samuel Robinson. His family, consisting of his wife, Mary A. Cheney, and 4 children, including Charles E. Cheney, age 15, lived in the town of Orange, Franklin County, Massachusetts. In 1873 Nathaniel Cheney secured a patent for an "Improvement in Fire-Proof Doors" (patent no. 137,345 dated 1 April 1873, filed 8 Feb. 1873). In the 1880 U. S. Census Nathan Cheney, age 56, born Massachusetts, lived at 124 Kent St., Brooklyn, NY. His wife, Mary A. Cheney, and two daughters, Rose and Lizzie, lived with him. His son, Charles E. Cheney, age 26, born New York, lived at the same address, but had his own family, consisting of his wife, Lilly, and a six-month old daughter, Bessie. The family had one live-in servant. Both Nathan Cheney and Charles E. Cheney recorded their occupations as "Iron Foundry." At the time of the 1900 U. S. Census Nathaniel Cheney, age 75, widowed, had retired from business and lived in Orange, Franklin County, Massachusetts. Head of the household was Cheney's son-in-law, Arthur Newhall, who was married to one of Cheney's daughters, Clara. Two other daughters, Rose and Lizzie, lived with the family. Nathaniel Cheney's son, Charles E. Cheney, lived at 810 Flatbush Ave., Brooklyn, NY. He lived with his wife, Lillian, a daughter, Bessie, and a cousin, Henry I. Moody. Charles Cheney was 44 years old, born May, 1856, New York. His occupation was recorded as "Manager." In July 1901 the General Society of Mechanics and Tradesmen of New York made sorrowful announcement of the death of Brother Nathaniel Cheney, at Orange, Mass., on June 29th, 1901, "for thirty-one years a member of the society." In the 1880 U. S. Census Charles Hewlett lived as a lodger with John C. Moses, a "gravel roofer," at 107 India St., Greenpoint, Brooklyn. Hewlett was 50 years old, born New York, the widowed proprietor of an iron foundry. In the 1900 U. S. Census Hewlett lived at 1091 Dean St., Brooklyn, with his wife, Jane, and a daughter, Margaret, age 13. Hewlett was 69 years old, born Oct., 1830, New York, and his occupation was recorded as "Iron Mfg." A brief notice in the New York Times, 25 April 1901, reported his death: "Hewlett, Charles, 1091 Dean St. age 70, on the 23rd." The firm Cheney & Hewlett was formed in 1881, and their offices were located at 201 Broadway from 1881 to 1890. This ad for Cheney & Hewlett dates from 1882. This ad for Cheney & Hewlett appeared in Lain's Brooklyn Directory, 1885. Their manufacturing facilities were located in Greenpoint, Brooklyn. New York's Great Industries, Historical Publishing Company, New York and Chicago, 1885, p.82, states that Cheney & Hewlett supplied the iron work for the Brooklyn Bridge: "For the iron work, [bids] from Messrs. Burnett & Co., Wm. H. Jackson, Heuvelman & Co., Cheney & Hewlett, J. B. & J. M. Cornell, and the West Side Architectural Works. The tender of Messrs. Cheney & Hewlett for $39,649, being the lowest, was accepted." Cheney & Hewlett were iron contractors at the time alterations and additions were made to the Tribune Building (1873-75) in 1881-82.
www.bklyn-genealogy-info.com credits Cheney & Hewlett with constructing the old Grand Central Depot, The Gilsey House, Singer Sewing Machine Co., Vanderbilt Building, Murray Hill Hotel (1884), Metropolitan Opera House (1882), Tribune, World (1889-90), & Evening Post buildings, and the Boston Post Office. There are problems with some of these attributions, however. For instance, the old Grand Central Depot was construction in 1869-71. The Gilsey House was also constructed 1869-71. The Evening Post Building was constructed in 1875. All of these pre-date Cheney & Hewlett as an independent entity. Possibly they were involved in alterations to the original buildings, as in the case of the Tribune Building. It is not clear what is being referred to as the Singer Sewing Machine Co. Possibly this refers to a predecessor to the famous Singer Tower. This "initial" Singer Building was built 1897-98, after Cheney and Hewlett had retired from the business. Cheney & Hewlett are credited with constructing the cast-iron building at 109 Prince St. at the northwest corner of Greene St. (J. Morgan Slade, arch., 1889). This building currently (2011) carries a foundry mark reading "Architectural Iron Company / Milford, Pennsylvania." The building was restored in 1993 by the Architectural Iron Co., specialists in historic restoration. In the early 1890s the original founders retired and ownership passed to Charles E. Cheney (1856-?) and Augustus T. Preyer (1862-?). By 1892 the firm name changed to Cheney & Preyer. Cheney & Preyer were in business from approximately 1892 to 1896. Two articles in the Real Estate Record and Builders' Guide give considerable detail on Cheney & Preyer. Vol. 51, no. 1305, March 18, 1893, p. 408, reported, "The firm of Cheney & Preyer have removed their offices to the United Charities Building, 4th avenue and 22d street. They manufacture and construct iron work of every kind for buildings, and are completing or have just completed the iron work for warehouses, at Nos. 110 Murray and 464 Greenwich street; a church at 312 West 54th street; a dwelling at 24 Remsen street, Brooklyn, and dwellings altered into stores at Nos. 47 to 51 East 59th street, for Architect Albert Wagner; for alterations the New York Bank Note Co., at the old Greenwich Bank Building, at 6th avenue and Waverley place, and on Pine and Water streets for John Pettit, and they are about starting work on a six-story fire-proof building, at No. 404 East 25th street, for Carl H. Schultz. Last year Cheney & Preyer finished work on five warehouses, at Washington and Watts streets; Nos. 117 and 119 Mercer street, No. 40 Watts street, Nos. 105, 107 and 109 Wooster street, the Mt. Vernon Post-office, Nos. 116 and 118 West 125th street, an addition to Lord & Taylor's on East 20th street, and an iron front at No. 57 East 9th street. This gives a general idea of their capacity and ability to turn out plenty of work of varied design and of the best quality." Charles E. Cheney was the son of Nathaniel Cheney. The 1900 U. S. Census recorded him at age 44, born May 1856, New York. He appears in both the 1910 and 1920 census reports living at 591 Westfield Ave., Westfield, Union County, New Jersey. In 1910 Cheney gave his occupation as "Secretary, Iron League." The Iron League was composed of businesses engaged in the manufacture and construction of iron and steel for buildings and other structures in the New York metropolitan area. An article in the New York Times, 28 Oct. 1921, dealing with anti-union activity in the steel construction trade, mentioned Charles E. Cheney as "Secretary of the National Directors Association." In the article Cheney is reported to having been asked to falsify the minutes of the National Erectors Association by omitting conversations relating to a conspiracy among construction executives. Augustus T. Preyer appears in the 1880 U. S. Census, age 18, born England. The 1900 census recorded him, age 37, born Sept., 1862, England. The census said that he immigrated in 1874. His occupation was "civic engineer." This ad for Cheney & Preyer appeared in The New York City Record and Building Trades Directory, 1892.